Kolam is an ancient Indian art form consisting of patterns traced around an array of dots. I find the patterns relaxing, intriguing, and almost musical. 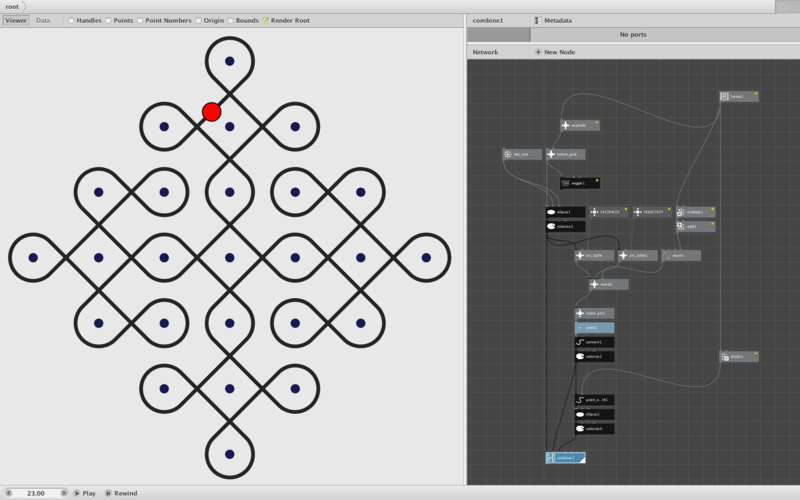 It was an interesting challenge animating kolam paths in Nodebox. This is my first attempt. I morph between two symmetrical one-stroke paths around a 1-7-1 kolam dot pattern, using a red dot to trace the path. I can see many different ways to play with these patterns, so this may be the first of many NodeBox projects. Screenshot, animated gif, and zipped Nodebox file attached.